Amsterdam attracts visitors from all over the world with its easygoing charm and impressive art scene. It’s perfect for laid-back vacation or a quick weekend getaway. Planning a trip to Amsterdam involves many decisions to be made including booking a flight and a hotel, as well as, making a list of places to visit. Getting from the airport to your accommodation and navigating the city means you need to have some knowledge of the Amsterdam transport system. While public transport is always the cheapest option to use, we will show you why it’s better to book an Amsterdam airport taxi online prior to your trip. When you travel with your family or you carry a lot of luggage it’s hard to use public transport and combine multiple transport options for your accommodation. If your hotel is not near the train or bus stop, you will need to take a taxi or take off at the Amsterdam Central Station and continue your journey by metro. If you’re not ready to go through all this trouble, the Amsterdam airport taxi service would be the best solution. The Amsterdam airport taxi provides a door-to-door service so the driver will pick you up at the airport and take you right on the doorstep of your accommodation. When making the online reservation, you will be required to provide the exact address of your destination and the Amsterdam taxi provider will make sure you get there on time. When organizing the Amsterdam airport transfer, the price for the service is an important factor. Fortunately, it’s easy to get an online quote for your transfer on the Amsterdam airport taxi provider’s website. By simply filling out the form with the basic information you will get an instant quote. Also, if the price fits your budget, you can easily make a reservation online. 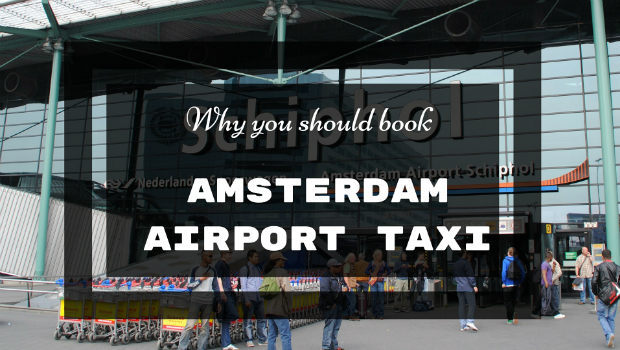 Usually, it is required to book the Amsterdam airport taxi at least 24 hours before you arrive. The provider will check if there is availability and inform you via email. If there are no additional requests, everything is done online and there is no need to call their office. The price structure can vary depending on the transport type. Flat rates are applicable to public transport while Amsterdam taxis charge by the meter. It’s important to take a licensed Amsterdam airport taxi in order to avoid overcharging. The taxi fare includes starting charge and an additional charge by kilometre and per luggage. The total cost of the Amsterdam airport transfer will depend on your destination and the traffic conditions. By booking an Amsterdam airport taxi online you will get an instant quote with a fixed, all-inclusive price. The total cost for the transfer includes the taxi transfer fare, as well as, flight monitoring, meet&greet service and free waiting time. The provider will monitor your flight and make adjustments to the pickup time in case there are any flight delays. The driver will be waiting for you at the meeting point holding a sign with your name and the free waiting time is 60 minutes from landing. The private Amsterdam airport taxi service is often considered as the most expensive airport transfer alternative. At first glance, the price for the Amsterdam airport taxi transfer is significantly higher than public transport, for example. However, there are more factors to be considered when analyzing the cost per passenger. Actually, the taxi transfer cost is charged per vehicle which means the cost is split among the passengers. The larger the number of passengers, the lower the cost per passenger. This airport transfer is especially convenient when you’re travelling with your family. You will avoid any additional charges for luggage or additional transport types to get to your accommodation. If you’re travelling with a group of friends don’t forget to get a larger vehicle and split the cost. It’s very hard when you’re travelling abroad on a tight schedule and you’re tied to timetables. If you use public transport to get from Schiphol airport to your destination, you will need to check the route map and timetable before you arrive. Although the trains and buses depart frequently, if you miss the train/bus you will need to wait for the next one, and sometimes, every minute counts. The Amsterdam airport taxi provider will not only arrange your airport transfer according to your schedule, but they will adjust the pickup time if there are any flight delays, as well. The flight monitoring service is included in the price so you don’t have to worry if there are any unexpected events which may lead to flight delays.